Properties in Vilhonneur average 4.7 out of 5 stars. Cottage with Heated Salt water pool in private & peaceful setting. Property 2: Cottage with Heated Salt water pool in private & peaceful setting. Property 8: House 8 places 300m from the space CARAT. Property 16: A farmhouse set in its own secure grounds with a private, outdoor pool. Luxury villa with heated pool overlooking a challenging 18-hole golf course. Property 21: Luxury villa with heated pool overlooking a challenging 18-hole golf course. 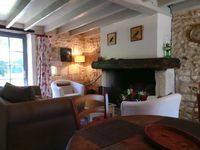 Chez Marot is a very comfortable light and atmospheric one bedroom gite. Property 34: Chez Marot is a very comfortable light and atmospheric one bedroom gite. Luxury villa with private pool overlooking a challenging 18-hole golf course. Property 36: Luxury villa with private pool overlooking a challenging 18-hole golf course. A delightful house in a quiet area near the border of the Dordogne. Property 38: A delightful house in a quiet area near the border of the Dordogne. Lovely villa with a lot of privacy, swimming pools, golf, and a swimming lake ! Property 39: Lovely villa with a lot of privacy, swimming pools, golf, and a swimming lake ! Property 43: Luxury detached villa with heated pool overlooking a challenging golf course. Property 44: Luxury villa with private pool overlooking a challenging 18-hole golf course. Luxury villa with heated pool on golf with lots of privacy and panoramic views. Property 47: Luxury villa with heated pool on golf with lots of privacy and panoramic views. Spacious luxury villa with private heated pool and sauna at an golf course. Property 49: Spacious luxury villa with private heated pool and sauna at an golf course. Tr&egrave;s bon s&eacute;jour, bon accueil, h&ocirc;te soucieux du bien-&ecirc;tre de ses clients, plein d'attentions. logement plein de charme, ce que nous recherchions. Au calme &agrave; la campagne, tout en &eacute;tant &agrave; proximit&eacute; d' un centre commercial. Tr&egrave;s bien accueillis au gites, le site est tr&egrave;s joli, on croise parfois des biches sur le chemin!